Christina Hollis: New Year, New You? PLAN: You wouldn’t dream of setting off on holiday without knowing how you were going to get there. Fuzzy ideas are more likely to fail. Decide exactly what you want from 2014, and write down your goals. Don’t just say; “I’m going to lose weight”, or “I’m going to write a book.” They are nice ideas, but too vague to take seriously. Turn your dreams into proper objectives. 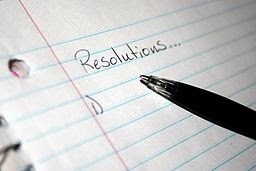 Be precise - “I’m going to lose fourteen pounds in weight by my birthday" or "I'm going to write a full-length romantic novel by December 31st, 2014.” They look both scary and impressive when you put them into words, but that's the idea - resolutions are all about growing and improving. Break your big projects down into manageable chunks, then create “to do” lists to help you whittle away at each one. Rather than endlessly slogging toward your distant target, reward yourself each time you lose a pound in weight, finish writing a chapter or reach some other significant milestone. KEEP GOING: Make a note of every single one of your successes - no matter how small. Whatever happens, keep going. Everyone has times when they let things slide. The important thing is not to let one mistake throw you permanently into reverse. Build on every tiny triumph until you’ve turned your vision from a dream into a reality. 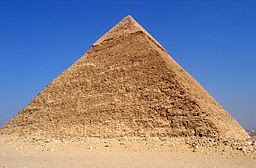 One day, a building team shoved a single stone block into exactly the right position on the Giza plain in Egypt. All they had to do was repeat that simple action another two million, two hundred and ninety-nine thousand, nine hundred and ninety-nine times and they'd created the Pharoah Khufu’s Great Pyramid. At 481 feet (147 metres) high, that’s the largest pyramid on earth - and it all started with that single block. How are you getting on with your New Year Resolutions? Have you got any top tips for success? Thanks, Margaret. I hope this year is a good one for you, too. Love your new FB page and picture, btw! Great advice, and really encouraging. Small victories keep you smiling. Thanks for this, feel encouraged. I'm glad it was a help, Lorraine. I hope you're having a good weekend!